It has always been apparent to me that growing orchids well requires good water. This year’s extreme drought has reinforced that view and impressed me with both the ability of some orchids to resist water with high dissolved solids and with the sensitivity of some types of orchids to salts in water. 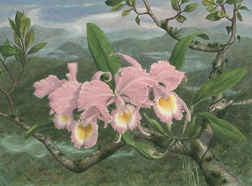 The thin leaved orchids, such as the intergeneric oncidiums, Coelogyne, and Eulophia, are the first to show symptoms of salt stress. Brown leaf tips are “the canary in the mine” when it comes to water quality, but can also be induced by too much fertilizer. Cattleyas do not typically exhibit this type of symptom but may still be suffering when water quality is poor. Exactly what causes the symptom within plant cells is not clear. A number of growers claim that providing soluble dolomite lime will prevent this type of leaf tip burn, but water low in salts will always prevent this condition. In my collection the orchids most sensitive to salt are the few phrags that have survived the summer heat. They may show a little tip burn, but mostly they get bacterial rots that ultimately lead to death, even if treated with bactericide or high quality water. Many of the phalaenopsis species as well as any species that comes from mist forests are also sensitive to water with high dissolved solid content. Leaves, however, are not the only indicator. This year, the lack of rain has been accompanied by very low humidity. In this climate, orchid roots will shrivel and stop growing even if they are being watered with high quality water. If water quality is poor and humidity low, roots may seem thicker than normal at first, but the growing tips will turn black and shrivel. Eventually, the entire root will shrivel from the growing tip and die. Under normal conditions, the root may shrivel, but quickly thicken to its normal size when provided moisture. That does not happen when the root is subjected to high salt content. The first significant rain fell in our area last week; filling my cistern and providing enough water to finally give my orchids a good soaking. Afterwards, it was clear which orchids still had good root systems and which did not. Most surprising was that the orchids in lava rock appeared to still have good root systems, despite the long held belief that salts tend to concentrate on that medium. Orchids in bark/charcoal-type mixes definitely lost roots during the drought when they were provided water high in dissolved solids. Like it or not, winter is finally here along with an array of things to do. With the exception of cymbidiums, all orchids need to be moved inside or into the greenhouse if they have been enjoying the “natural life” in your backyard under the trees. We are also just 1 month shy of the winter solstice so the sun is just about at its lowest point in the sky. Greenhouse growers that use shade cloth, often remove it, or at least reduce shading during the next couple of months. Phals exposed to a week or two of cooler temperatures have initiated spikes and now need to be kept warmer, especially at night. A night temperature of at least 65 F will virtually eliminate winter bacterial rots, although some growers use 60 F as the absolute minimum to keep heating bills down. The key for phals is the minimum temperature and avoiding water in the crown of the plant especially when night temperatures are low. Contrary to some of the published orchid growing books, apply high nitrogen fertilizer to your phals now, but at lower concentrations. At one time high phosphorus fertilizers were recommended, but studies have not been able to document a benefit. To obtain the best flower color use a high nitrogen cal-mag type fertilizer. Cattleyas, especially species, need to be kept on the dry side now. Let them dry more thoroughly than you did in summer. There are a number of fungal rots that are around all of the time that really thrive on these cooler nights if the medium is moist. Some of these can kill a cattleya almost as fast as bacterial, crown rot kills phals. This is also the time to dry out catasetum and similar species and hybrids, which thrive on water during summer. They will rot if watered in winter. Some growers remove them from the pot shake the medium from roots and set them back in the pot to dry. Other growers just set them in a part of the greenhouse that does not get watered. A little mist on sunny days is all they need. There are any number of species that require the same approach and you may need to refresh your memory of their natural habitat for these unusual forms. If, the species comes from a wet-dry type habitat, drying is usually required.